Having exhausted everyone in my physical proximity, I was sitting around this weekend just hoping someone would ask me about DS106. #ds106 folk help me out. 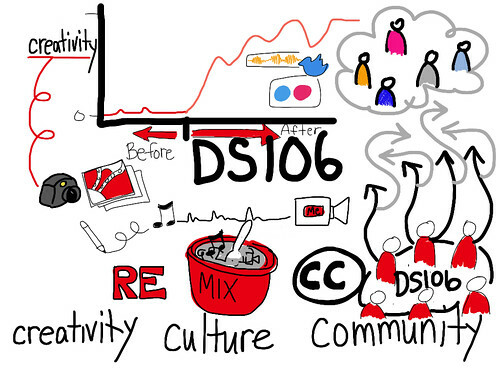 @jimgroom & I need short video clips telling me what made #ds106 special, powerful, fun, different etc. Anyone? This is the second animation that I’ve tried using this method. The first one was last week for Dave Cormier’s #change11 session on Rhizomatic Learning. I find it interesting that Rhizomatic Learning has 300 views and two “likes” whereas this DS106 video has only had 30 views and already has 5 “likes” and 3 comments. I realize we shouldn’t conflate mouse clicks with engagement but this is a good example of how I feel the DS106 community is so encouraging and enthusiastic. What I meant to mention in the video was the essential role of commenting. My first post was just two drawings, no text. The comments caused me to revisit the post and write out context and process. Luckily, Tim and Alan have already touched upon this in their videos. And maybe you will too? There’s always time to tell the world about how much you love DS106! I used the Taptrix Brushes app to do the drawing, which records your brush strokes as you draw. I have been mostly using AutoDesk SketchBook Pro for most of the work in my Visual Practice. I use a pogo stylus. The hardest part is erasing and redrawing because it does not do frame-by-frame animation, just records everything you do. Then I have to extract the .zip file into a .brushes file, open the file on the desktop Brushes App (free download). Then export to MOV. Then Import into iMovie. Alas, this is Life With an iPad, where moving content is notoriously painful. I feel like I help sell these infernal devices every time I do a drawing on one, so I must tell you: it is not all rosy. It takes patience and tenacity. I used PhotoBooth to record the video and just watched the animation as I read. (This is why I missed the key important bit about comments) Finally I brought the whole thing into iMovie. I confess I also despise iMovie 8 and up so I’m still using iMovie HD (v. 6?). I had to export the thing about 4 times before I got the settings correct. YouTube wants wide screen but Brushes exports 800×600. I tried to get the smooth voice of @scottlo to do it, but alas he’s too busy dissecting his teaching. Your product is charming and informative; your process is tortuous. I have put out an e-mail to my tech group to see if anyone has found a better ap to capture animation, although I understand it isn’t the drawing itself, but the antiquated methods of exporting the product. You know, Apple couldn’t put all the goodies in just two iPad releases! Noooo, we will have to pony up the big bucks for Flash, for easier exportation, gawd only knows what they will come up with that we just gottahave! See you round the internet! Flash & iPad. No. Don’t think we can expect that anytime soon. I do have Flash, in fact I have the whole Adobe CS5 suite and actually have done many a “Learning Object” using those tools but given Flash’s limited use on *i* devices, I basically stopped using it. To be clear: my main complaint is the lack of open file structure in the iPad not the Brushes app itself. I would like to plug in my device and see a listing of all the files on my iPad, whether they are movies, drawings, pictures, music. I think if I jailbreak the thing this is possible, but I don’t think I should have to circumvent the system to make it usable in this way. Oh my gosh! wow this is a truly fantastic video… i love the animation work.